Why did I start with this question? The answer is because it is the first question we will be asking you. No, it’s not to start with “I told you so” for overlooking the small matter of backups, but a recovery may involve building the data from multiple sources ie from a combination of the failed hardware and any other data instances such as a backup. Note that hardware failures and data corruption do occur all the time. We have/will write many blogs on this topic so please keep posted. The short answer is, maybe. 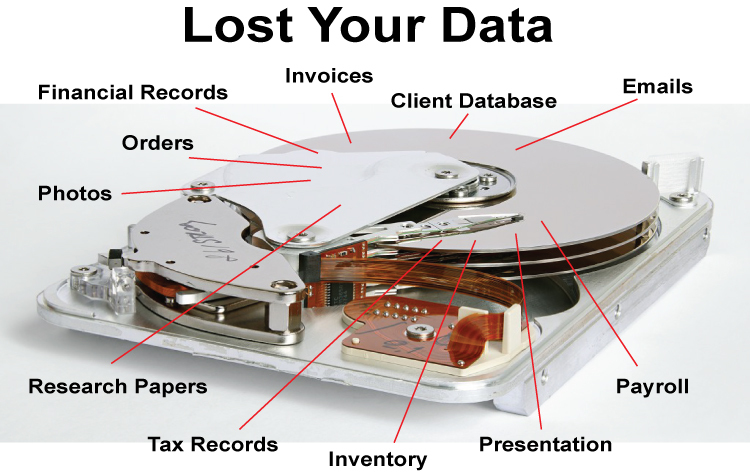 There are many dependencies and types of data loss and corruption. A disk can fail for many reasons. Keeping things very simply, a fault can be caused by anything from a file system corruption, logic (circuitry) problem, motor (servo or spindle) or media (storage platter). The worst problem to experience is media damage caused by a head crash. In these extreme circumstances data cannot be recovered from the affected areas. However, depending on the extent of this damage we may be able to recover data around that damage – only if we get the drive early. The more a drive is run post head crash, the worse the damage gets. In this case power the drive off ASAP and get it to us. There’s a lot of technical information on the net about media damage so I wont waste your time regurgitating the same info. We need to see the disk so we can advise correctly. Contact us. If we do not recover your data there is no charge. My drive is making noises? Not a good sign to start with. If the drive is still working then back the data to another drive and throw that one away. If the drive is making noise and it’s not working then power it off as soon as possible (now) and get it to us to look at. Do not prolong the problem at this point by keeping the drive powered on and running “tests”. Can I recover the data myself? The short answer is, maybe. Again, it depends on the type of problem. If it’s just a file system corruption, maybe, using various tools available. Many good/proper tools are not free and I would strongly recommend to be wary of “free” tools that are offered on the net and what they actually do. Many of these filesystem tools can do things such as recover deleted files, etc. If it’s media damage, unlikely you can repair it at home. Do you have a clean room? You will need one. You will also need some quite expensive and complex tools to be able to dump contents of disk blocks and rebuild to another drive. Do NOT open the hard disk drive. A disk drive must never be opened outside a certified clean room. Yes, we have one. How much does it cost to recover the data? It depends. Some variables include: the type of fault or damage, the age of the drive, what you did to it since you noticed the fault, etc. so We need to see the drive. In all cases we will provide a FIXED quotation and wait for your approval BEFORE we proceed. We will perform some tests on the drive and provide you with a FREE quotation. It may take us 24 to 48 hours to test and evaluate the drive. If you are happy with the quotation we will proceed. If you are not happy with the quotation we will return the drive and THERE WILL BE NO CHARGE. We DO NOT charge to provide a quote. We DO NOT charge per amount of data. We DO NOT charge if we do not recover the data – NO DATA, NO CHARGE. The costs can be anything between $200 and $1800. Note we offer a FREE quotation, if you are happy with the price we will proceed with the repairs. If you are not happy with the quotation, we will return the drive and there is NO COST for our labour. Any cost associated with delivery or return of the hard disk drive will be yours or we can organise shipping for you for a fee. Contact us. Once recovered, how do I get the data? There are two parts to the data recovery process. Firstly, we need to repair the drive so we can then read the data. The sole aim of the repair is to allow us to read the data. Once we can read the data, we will extract it and copy it onto a NEW drive. It is strongly recommended to throw away the fixed drive once it was repaired due to reliability concerns. You can provide your own recovery disk drive or we can provide one for you. It depends. The repair (if successful) may be relatively short in terms of hours but maybe days if we need to wait for spare parts. The data recovery itself may take days thereafter. With greater capacity drives the data recovery process is slow and cannot be easily estimated. My data is urgent and cannot wait. Can I have priority? Yes. We do offer a priority service at extra cost. Contact us. What sort of devices and data can be recovered? We can recover data from many devices. The main device we see is hard disk drives (platters). Other devices include solid state disks (SSDs), tape, USB sticks, memory cards and even mobile phones. Please note that some of these devices do pose challenges and data recovery may NOT always be possible. Encryption is one such challenge. Without keys this is impossible. We have approximately 90% success rate in recovering your data. Note that we offer a free assessment and quote. If we do not recover your data, there is no charge. The facility (certified clean room and specialised tools) is based in Sydney (Australia). Media can be shipped to/from us to anywhere in the country. Do NOT open the hard disk drive. Take note of what may have caused the problem (I accidentally dropped it) or when you first noticed the problem (during initial boot when I arrived in Melbourne). It is very helpful if you give us a good description of when it last worked and when it didn’t. Get the disk drive as securely as possible with appropriate packaging ensuring protection from any further damage. Oh. I nearly forgot. DO NOT open the hard disk drive. Regardless of what you’ve seen on YouTube, or the expertise of your friend, a disk drive should remain sealed and only opened in a certified clean room. We have one. A disk cannot be exposed to any contaminants such as dust, hair or even a fingerprint. The space between the disk head and a platter is not forgiving at all. Note that if you tell us that your drive was not opened and upon our inspection of the unit we find that it was, we will charge for the time and effort spent on it and the drive will be returned as is. Yes, we can tell. Do we have a phone number / are we contactable by phone / are we human? Yes and yes and except for one of us, yes. More than 90% of our calls are answered by the above questions. As we aim to keep our costs down in order to provide you with a competitive quotation, we prefer to have our technicians head-down, oppressed [;-)] and concentrating as much as possible on your data recovery. Apologies for this but you can always drop us a note via our Contact Us page with your queries and we can call/contact you back during one of the meagre breaks. Are All Backup Products Equal?